“Time is money”, so the saying goes. It’s a tale as old as time…and money, if that saying is true. I think I’ve looked too deeply into it. Anyways, the point is this, the more time you can spend on your business, the more money your business can make. This is especially true in mortgages, a marketplace in which focusing on borrowers and closing more loans should always be a top priority. But how can you be expected to handle your borrowers and closing loans, as well as things like manually pricing loans and PMI, calculating profit and margins, making all of the necessary compliance checks, researching historical pricing data in the event of a re-price on a locked loan, marketing your current mortgage rates online, creating and maintaining a sleek and user-friendly website, tracking down and managing any new leads, and anything and everything else that comes with this business. Well here at Mortech, that’s exactly what we want to do: take care of everything else, so that you can focus on the most important thing, the borrowers. Let’s assume it takes the average loan officer 45 seconds to manually grab rates and adjustments from an investor rate sheet. If that loan officer’s bank is selling to ten different investors and wants to perform best execution, that would take seven and a half minutes to check the base rates. If we also assume it takes two minutes to add fees and calculate APR, that takes the scenario up to nine and a half minutes total. Now for simplicity’s sake, let’s estimate that the loan officer would need four minutes to verify loan eligibility and calculate QM eligibility and HPML. This bumps the scenario up yet again, now to 13.5 minutes. If the average community banker’s loan officer gives five quotes per day over the course of 20 business days in a month, that comes out to 1,350 minutes, or 22.5 hours spent just checking rates. However, in Marksman, these 100 quotes would all be returned with eligibility and compliance checks ran in under 200 seconds, so approximately three minutes. That comes out to a monthly timesaving of just under 22.5 hours total. This means instead of spending nearly three full workdays calculating rates, your business can spend that time where it matters most: with your borrowers. We can take care of things like calculating rates, running compliance checks, and even notifying you every time a new lead comes up, leaving you without all the hassle of the business, and letting you get back to closing loans. 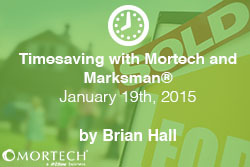 If you want to know more about what Mortech and Marksman can do for you and your business, click here. Or if you want to schedule a consultative demo today, and see for yourself how our solutions can help streamline your business practices, click here.